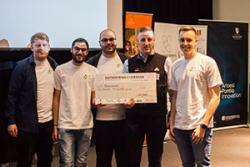 Enterprise by Design is back for its 7th annual competition for 2018, and the winning team has just been awarded a cheque for £2,500. The challenge brings students from the areas of Psychology, Electronic Engineering and Computer Science, Business, Product Design, and Creative Studies and Media to work together in multidisciplinary teams. Their goal is to create a product or service for local businesses over an 8-week period. The winning team were: Tom Owen, SCSM; Loizos Vasileiou, Computer Science; Christos Tsangaris, Psychology; ( with Nick McCavish, Operations Director, Zipworld;) Aaron Owen, Bangor Business SchoolEnterprise by Design has long been a key example of multidisciplinary study at Bangor University, giving students a unique opportunity to collaborate with students in other departments that they might not get to work with during their normal courses. Andy Goodman, Director of Pontio Innovation, said of the 8-week process, “we set out to provide a simulation of creative startup, and you can’t teach this in a traditional, didactic way. It has to be experiential”. This year, Enterprise by Design worked with two companies in the local Adventure Tourism sector, Rib Ride and Zip World. Adventure Tourism is beginning to boom in North Wales and is a fast growing industry for local businesses. Students are fortunate to be able to work with two thriving companies; not only do they get hands-on experience working with a client, but they have opportunities to learn about marketing, app development, wellness tourism, and most importantly, multidisciplinary teamwork. With the recent announcement of their new joint-venture attraction, the Velocity RIB, the fastest rigid inflatable boat in the world, the two companies asked students to come up with ideas to draw new visitors to their latest attractions, whilst also bringing back repeat visitors. Samantha Vaughan (Psychology), Vicky Wiglusz (Business), Christopher Smith (Electronic Engineering) and Alex Baines (Product Design) were presented their second place cheque by Jim Jones, Chair, North Wales Tourism.The teams were encouraged to look at ways their ideas could benefit not just the companies and local tourism, but the customers themselves. Throughout the 8-week process, students worked on a multitude of tasks aimed at bringing a Wellness aspect to the fore of their concept. Nick McCavish, Head of Operations at Zip World, said of this year’s teams, “For the winners this year, we’re looking for an app that as a business we could use within the next six months and return in investment…and also ensure Zip World is also working with other businesses in North Wales to bring more and more people into the area”. Zip World, who were EbD 2017’s company as well, employed last year’s winning team for a number of months, and Nick hopes that will continue. He expressed that, “it’s been fantastic to be associated with the students at the university, and its something we want to continue over the next few years”. The winners of this year’s Enterprise by Design, Team Benchwarmers, came up with an innovative idea that the judges really loved. They pitched and created a prototype of an app called Step Outside, which encourages users to engage with local restaurants, attractions, and outdoor activities. The team had four minutes to present, to entice the judges to visit their trade stand, where they clinched the deal; demonstrating their working prototype, together with a compelling brand and convincing business concept. Third place team: Raja Asad, Bangor Business School; Kathryn Mayoh, Psychology; Nathan Biggins, Electronic Engineering; Peter White, SCSM With Phil Scott of Rib Ride.Aaron Wiliams from Bangor Business School said of the experience, “I think one of the things that helped us a lot is we got on really well and even though we put a lot of work into it, we did enjoy every minute of the experience”. With their first-place money, the team may get to develop their idea with Rib Ride and Zip World over the next few months, or they could use the seed money for a business of their own. The Benchwarmers team hopes that their winnings can help further develop their idea, and most of the team members hope to come back to Enterprise by Design next year. 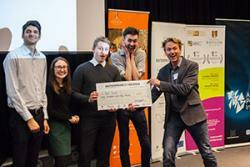 Winners of the second and third prizes received £1,500 and £750 respectively to also help seed a business idea. 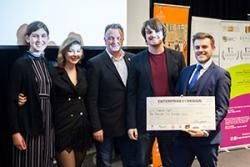 The competition continually benefits local businesses with dozens of ideas from our undergraduate students, from how to reach a new generation to that unique concept design that draws in thousands of tourists. We’re excited to see what next year’s cohort can bring to the table.